After my recent recipe of Pork Loin Medallions in Balsamic Honey Glaze a couple weeks ago, I made sure to save the other half of that beautiful pork loin in the freezer so I could use it for something else. Though I was tempted to have the same dish again tonight because it's super tasty (and I've been getting some wonderful emails & comments about it) I have just been too full of recipe ideas lately, so I had to get at least one out before another long work week. I was inspired to make this because of something similar my local Trader Joe's used to carry a couple summers ago. They offer a stuffed beef dish that has either the same or slightly different stuffing, but at around $9.99/lb, it was one of those splurges that I used to be able to get but can no longer afford now. Still, I'm not one to give up having something good just because I can't afford it, and since pork loin tends to be leaner than beef (and less spendy) and because I'd just gone on a Trader Joe's run with my mom who came to visit me this weekend, I thought it would be fun to experiment. This is another one of those examples of how to have a swank looking meal without forking over the swank amount of money to line someone else's pockets. Presentation really is everything, and it makes all the difference in the world if you want to make a simple dish look super attractive. And just because it's simple doesn't mean it's bland! The combo of spinach, sweet red peppers, and tangy feta complement each other very nicely and go great with the lean pork. Though I cook for one most of the time and was able to make a couple meals out of 1 pork loin, this is also a very affordable dish even if you have to grab enough pork loin for 4+ people. It's also a healthy, flavorful meal that takes about 45 minutes tops to make (including prep time). If I had a family I'd definitely say that this could be either a busy weekday night or weekend meal. Don't worry if you don't have all the herbs available for the Herbed Cous Cous. Even a small combo of 2 or 3 different herbs and a light dusting of sea salt will transform your cous cous into something more exotic. Plus, with the deglazing of the pan after the pork has been cooked, you have a lovely sauce that will add a ton of taste to the final product. I encourage you to experiment with different herbs for the cous cous, though; it's always fun to see what one comes up with if one gets creative enough. Here's the recipe! Filet the pork loin lengthwise until you have a smooth, even sheet about 1/2" thick. Next, cut the sheet of pork into strips about 2" wide. Take one strip of the pork loin and arrange about 4-5 spinach leaves on top. Then add a few of the red pepper strips, followed by a few sprinkles of crumbled feta cheese. Roll the pork loin with stuffing into a tight spiral and fasten with a toothpick. Continue this procedure until all of your pork strips have been stuffed. Prepare the herbed cous cous by bringing 1 c water and 1/4 t salt to a boil. Add the cup of cous cous and the teaspoon of butter and stir well, removing from heat. Let sit for about 5 minutes, then fluff with a fork. Season each pork loin roll with salt & pepper. Heat a couple tablespoons of olive oil in a skillet over medium heat. When oil is hot, place the pork loin rolls in the skillet, seasoned side down. Season the other side with more salt & pepper, then cover and allow to cook for about 3 minutes on one side. Turn each pork roll over and cook on the other side for another 2-3 minutes, or until the pork is no longer pink when cut. Remove the pork and set aside on a plate. Reduce heat and add the wine or chicken broth to the pan, scraping up any brown bits until you have a nice bit of sauce. 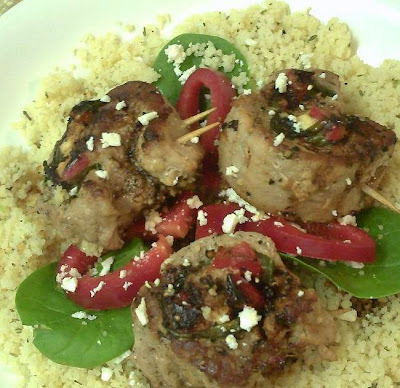 Spoon some of the herbed cous cous onto individual dishes, then add 2-3 of the stuffed pork loin rolls on top. Drizzle the pan dripping on top, garnish with extra red pepper strips & spinach, crumble some extra feta on top, and enjoy! k this looks awesome! Im going to try it tonight(well, monday night)! I love spinach..I've been craving it lately. I love the recipe. I found you thru SN&R article. Great blog. I'll be back. Wow, this recipe looks really good. I don't cook meat that often, but if I do I'll have to try it. I just bought some cous cous today. Does the whole grain variety and regular take about the same time to cook? I bought the French kind... (I'm now a fan of yours on facebook too).